Sooooooo, my team is the winner of the competition!! The underdog team ruled the competition!! The Sony Tablet belongs to the underdog team!! I am soooo happy when Anindita Saryuf the Senior Fashion Editor of Elle Indonesia announced that me and Dion are the winners . Well, you can see my super happy feeling from these pictures. My mouth wide open like a hungry fish. It is weird that when I am happy, I look ugly. the ugliest ... huuu creepy happy face. The expressions of the winning team!!! 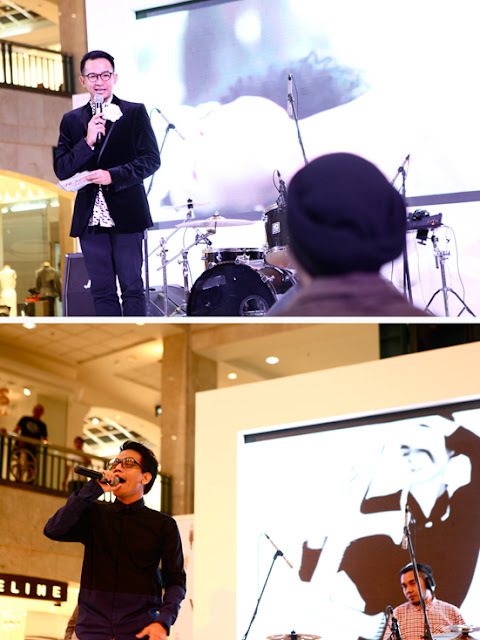 BIG thanks to Elle Indonesia and Dion Wiyoko! ... and also bang nengah as the photographer, you captured so many precious moments here! Hello, my readers! This time I will share about my full of fun experience on last Saturday. 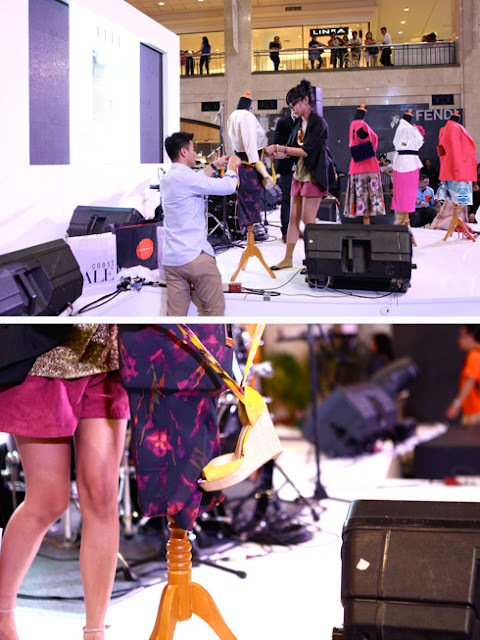 Yes, on Saturday I joined Elle Indonesia Runway to Street Styling Competition. 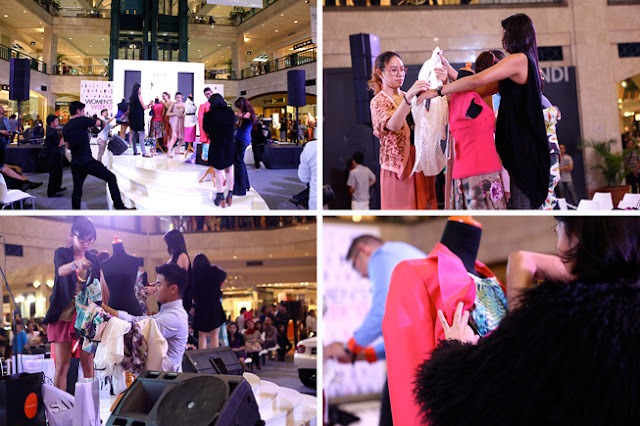 This event is greatly inspired by the creativity of fashion bloggers in creating stylish street style looks from the runway. 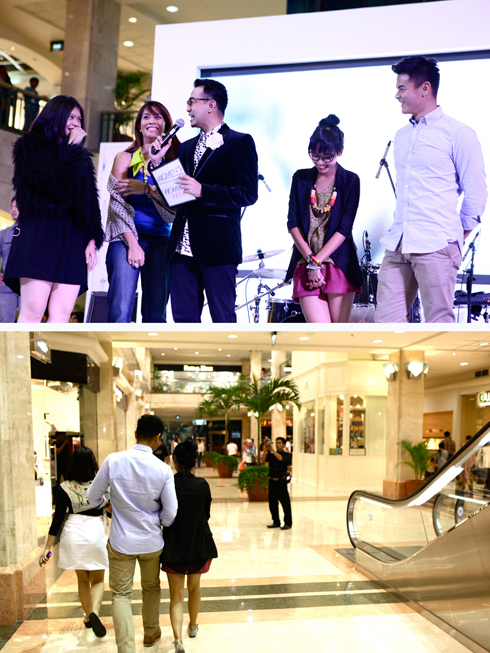 and 4 celebrities (Kenes Andari, Dion Wiyoko, Jessie Setiono and Adella Fauzi) in the competition. The Elle team separate us into 4 teams consisting of two people, 1 blogger and 1 celebrity. They gave us 15 minutes to borrow clothes from couple of their partner stores (Karen Millen and Coast) in Plaza Senayan to create a high-street version of one runway look from them. At first, I thought I have to mix and match the clothes for my teammate. So, when they told me that Dion Wiyoko is my partner, I almost had a panic attack. Hhmm, for me it is not that easy to mix and match men clothes. Dion Wiyoko is an actor and presenter, here in Indonesia. At first, when I got the email from Elle magazine, I have no idea who's Dion Wiyoko. So, I google it, and I recognize his face!!! -__-' Haha! I watched one of his movies, Serigala Terakhir, which is one of my favorite Indonesia movies. Dion is a guy and don't really understand about runway fashion for woman. So, we're agreed that we're the underdog team here. This is going to be a really long story about the competition from the beginning --- end. So, be ready and don't get bored. he's a broadcaster, an mc and an entepreneur. I can say that he has a really nice voice. Before we start the competition, the host asked us to go up on stage to have a small interview and gave us a picture of a runway style. We have to re-create the look into something more creative and stylish look. Well, the rule is 'the most creative and also stylish look will win the competition'. So, I have to nailed it!!! This is our serious and clueless face. We allowed to borrow 6 items from each store. We're trying to make sure that we chose the right clothes, shoes and bags to recreate the look. You know what?? We borrow 6 clothes in less than 5 minutes from Karen Millen. Nice job, underdog team!! What were you thinking?? From Karen Millen we move upstairs to Coast. I totally have no idea about the clothes in this store. But, they sell really nice clothes and clutches. and flat shoes from Zara. 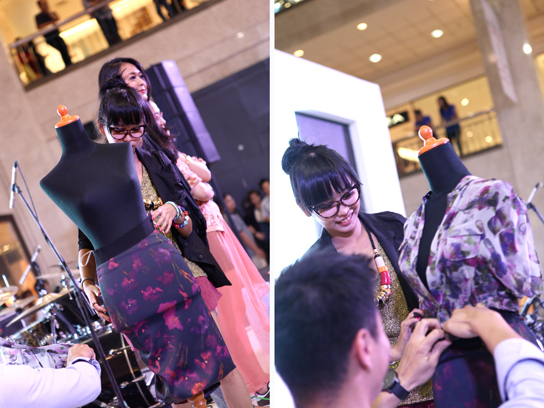 Back on stage, we have 5 minutes to recreate the runway look into something more stylish and creative. Okeeeeyy, I was so panic and confuse. The dress was too small for the mannequin. We were the last team on stage because at the beginning we have problem with the dress. I decided to changed the dress with floral pencil skirt and sheer shirt plus champagne color cropped blazer and yellow shoes and clutch bag. I really like the yellow shoes, I want it. Even tough my teammate is a guy, surprisingly we worked and rocked the competition as a solid team! Haha! The good thing about Dion as my teammate is that I can nailed the look based my idea and he kinda support me for that. Hihi! My target is the Sony Tablet. Well, I am sure the other bloggers also targeting the tablet. The point is, I had a really great day that night. Last night, I went to my friend's wedding reception with my boyfriend and our senior. We had such a full of fun night! Laughing, taking pictures and gossiping. Haha!! we don't see each other really often. So, once we met, we have soooo many things to talk about. Last night I'm wearing this little black dress to the wedding. The dress is from Auburn and Ginger's premium collection. The dress is really comfortable and it has a really nice cutting. This is kind of simple and girly look for a formal event. It is so easy to mix and match your little black dress to any kind of shoes, bags and belts. It depends on what kind of event you're going to attend. 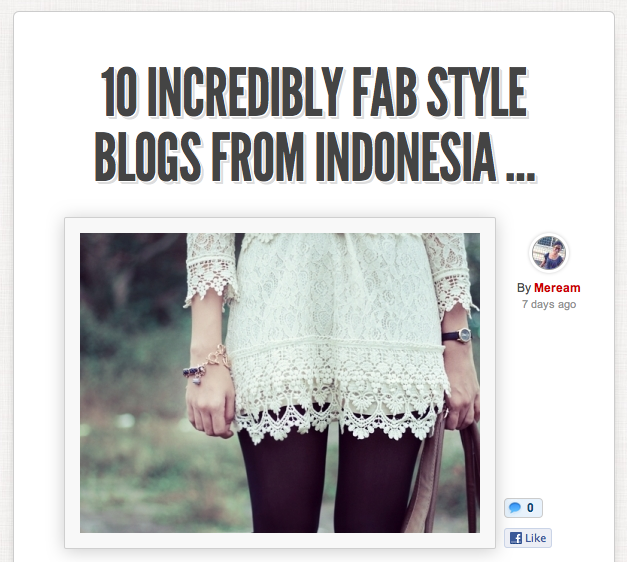 as one of 1 of 10 Incredibly Fab Style Blogs from Indonesia. I am quite surprised that I am on of them. and many people visit my blog from this site. 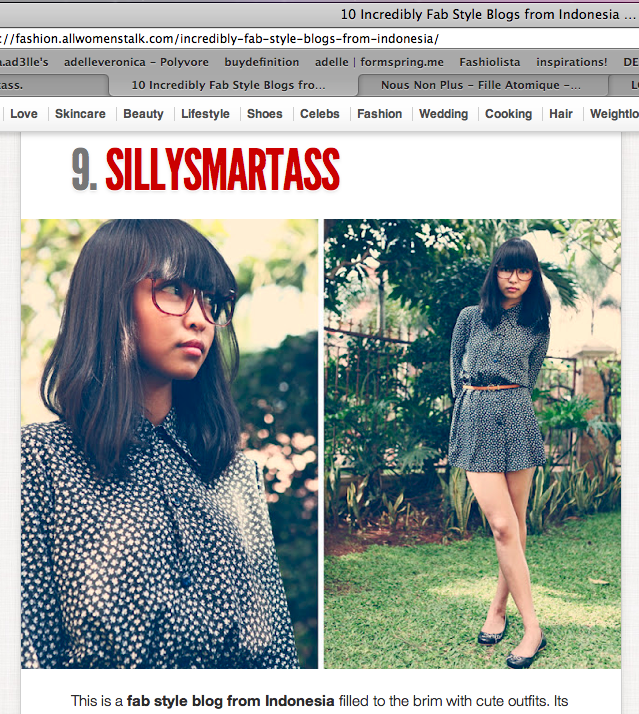 I am at number 9 out of 10, so, I am so happy that my blog is one of the stylish blog in Indonesia. I know the other blogs are much way better, more stylish and inspiring than mine. they're such a really nice and stylish person. Well, I can say that they're my seniors as a blogger because I just start my blog a year ago. So, being featured on the site is inspired me to be more creative and unique in fashion. and hopefully it will inspired my readers too. I hope you had such a good day today. This week is going to be a busy and tiring week for me. My brain is almost crashed. My brain is tired. My brain need some rest. Many people think that it is good to become a doctor. Well, I agree with that, BUT it is not easy to become a good or even a great doctor. It is too tiring and stressing sometimes. So, if you're really want to become a doctor, you have to make sure that you're ready to face many kind of annoying patients, nurses, terrible night shift, surgeries and sleepless night during the night shifts. If you have no problem with those kind of nightmares ... go for it!! Be a doctor too!! and unbranded glasses and shoes. This look is totally different with the previous one. This one is more dark and ... wild?? Haha! I love to try something different and play with it. I hope this post will inspired you! 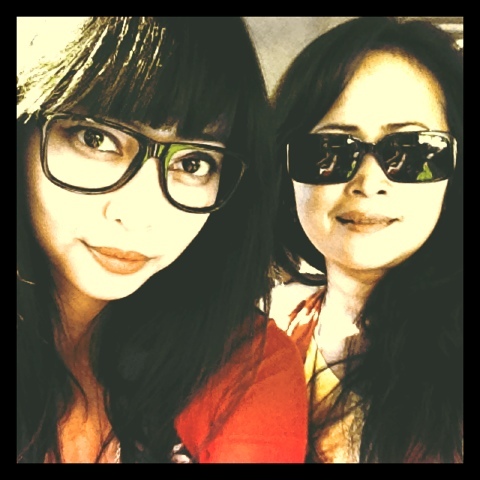 Hi readers, last week I went to Surabaya for few days to visit my grandma. I can tell you that the weather in Surabaya is worse than in Jakarta. Extremely hot and dry. Crazy. Even though the weather was insanely hot, I am totally had fun with my family, even my grandma join us to the karaoke until almost midnight. Surely, I have the coolest grandma in the world. Haha! We also went to Madura and bought some batik. From Madura, we were going back to Surabaya and we had a great happy time at Zangrandi ice cream. They have so many different kind of tasty ice cream. This place is a heaven for ice cream lovers. You should try it if you go to Surabaya. and she bought me a couple new glasses! and H&M glasses and black flats. 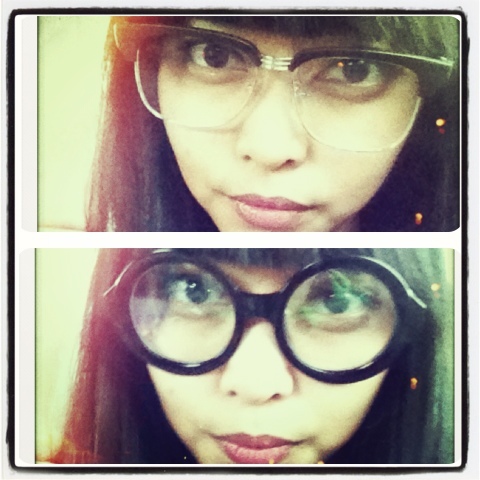 I loooovvveeee my new glasses!!!! How are you my lovely readers? Well, kinda busy lately and I have to go out of town to visit my grandma a few days ago. What a great thing to do when I have nothing to do at home. After I got the documents, I can apply to some hospitals to find a job. It is so difficult to get a job in Jakarta. So, please, wish me luck! The polkadot dress is my own design for La delle Clothing, which is my own clothing line. The lovely brown satchel bag, I bought it at H&M, Singapore. The leopard wedges, it's Up Shoes. The round glasses is an unbranded stuff. The look is so simple but still make you look so girly and eye-catchy. The messy bun,the round glasses, the pearl collar and red socks are my favorite about the look. Without these items, the look is just an usual vintage look. 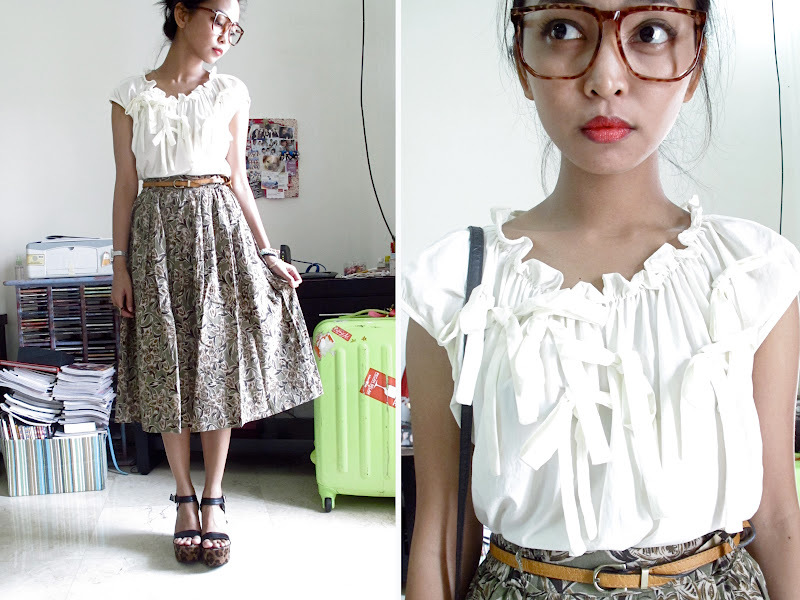 You can try this kind of look with your own stuffs. 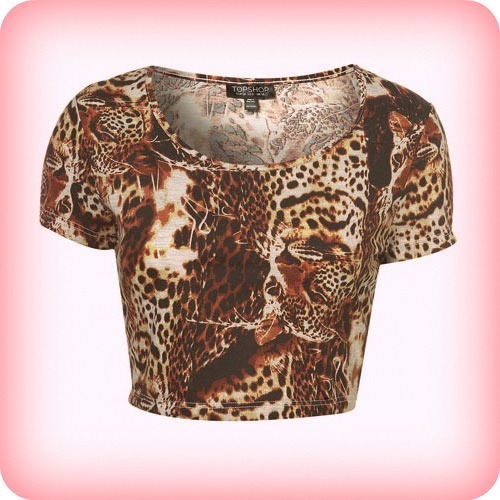 Have fun with your fashion stuffs! Fille Atomique is French language, it means atomic girl. Hhhmm, I like to listen to the song even though I totally have no idea about what they sing about. The music is really cool and fun. I am totally in love with bright colors lately. Now I am decided to pull it together in one outfit. As you can see, I am look like a rainbow cake in this outfit. Colorful and ... yummy! Haha!! Sorry, I'm just kidding. I bought the top hat and salmon color top from an online shop, Goitaa. I got the mustard short from Auburn and Ginger shop, a street style online shop and you can catch them via their facebook. They sell some vintage, girly and classy kind of clothes. The brown satchel bag, I bought it at H&M, Singapore and the floral wedges from Amante. The title of this post is inspired from a song by Gotye. The song is really nice and I love to listen to this song over and over again. The song is not about my personal experience, I just love to listen to it. Enjoy the video and the song! I am so happy that finally I have some time to updating the blog. Lots of things to do lately. On April 5th - it is my boyfriend's birthday! And today, we celebrating Easter Day!! Such a really full of fun and lovely week I had. Actually, the outfit represents my mood. Celebrations mood. Bows and flowers. Two common things you see in celebrations events. 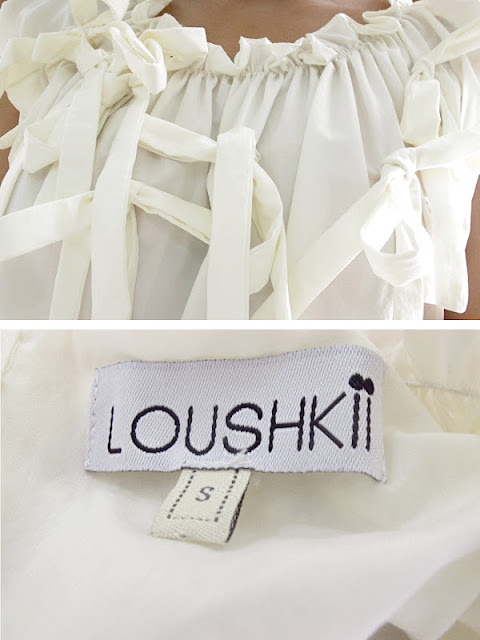 By the way, the Annie's Ribbon top is from Loushkii, a local brand from Indonesia. 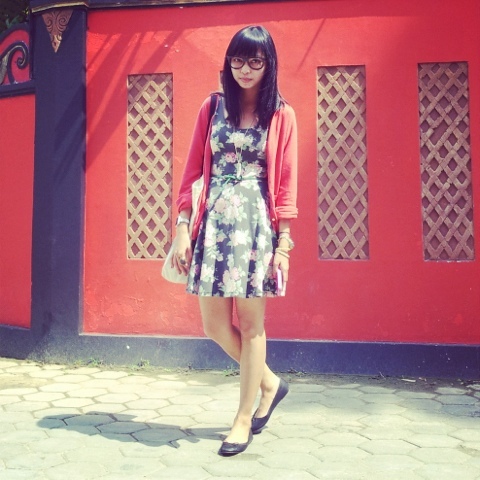 I bought the floral skirt at flea market. So vintage and I like the color. And the leopard wedges is from Up Shoes. Lovely!! Hopefully, this post will inspired you.